So I have a bit of a backlog of beauty products that I’ve tested and thought I’d make this week a bit of a Beauty Week on the blog. Come back later this week for more beauty reviews! NB: I purchased this product with my own money and have been provided no incentive to affect my review. All opinions are my own. All links are non-affiliate links. I mentioned this oil in my recent round-up of skincare things I’ve been loving, but I thought it merited a deeper review. 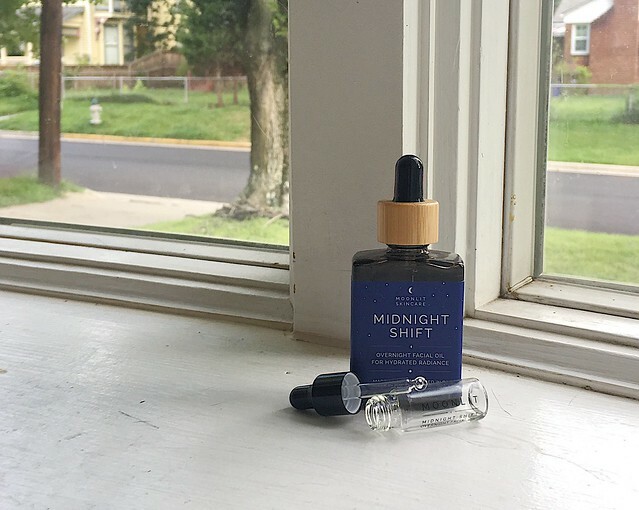 I first saw Moonlit Skincare on Instagram and loved their peaceful photo aesthetic, but was a bit concerned about the ingredients in their star product, the Midnight Shift Facial Oil. I’m very wary about olive oil in products because it’s caused breakouts for me in the past. But I was in the market for a new facial oil after realizing that I prefer facial oil to watery serums after my hydrating toner, and wanting to find something a bit less dear to use when my Herbivore Phoenix Oil runs out. So I went conservative and bought the 14-day trial kit. This kit comes with two 5-ml vials of the facial oil. Each one is supposed to last a week, but I got two full weeks’ worth of use out of one vial, and was so hooked that I decided to save my second vial for an upcoming trip and go ahead and buy a full-sized bottle. I used the oil as directed, dispensing about a dime-sized amount into the palm of my hand, spreading it quickly over my palms, and pressing it into my skin after using my watery hydrating products at night. I sometimes tent my hands over my nose and just inhale the beautiful, relaxing scent. It smells a bit like lavender Earl Grey tea, which you know I love. The oil absorbs fairly quickly, but still provides enough slip for a little jade rolling after application. Since it’s been so humid, I find that this oil is all I need for a last step to seal in hydration and moisturize my skin at night, but if I need a bit more oomph, I will follow it with a cream. I find the scent fades quickly once I’ve put it on my skin, so I don’t know how much the aromatherapy helps me fall asleep, but the ritual of applying it is relaxing and helps me unwind. All in all, this is a beautiful facial oil, at a fantastic price for a blended oil, with a lovely scent. I’ve already repurchased it since my first purchase, and will continue doing so in the future! It’s a really beautiful oil, especially considering how reasonably priced it is. Interesting! I would like to try this, but wonder if you got to pay import tax when ordering from the US? Actually, while the raw materials are from Bali, the company itself is based in California, so it just ships regular USPS (maybe FedEx?) and I didn’t notice any additional taxes on top of the listed price (although you might have to pay sales tax if you’re in CA).